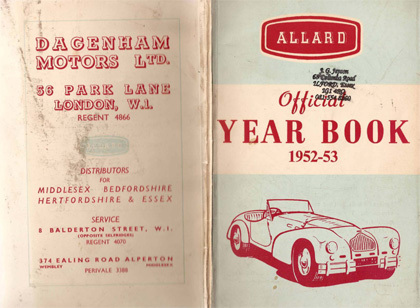 Unknown to most current Allard owners, the Allard Motor Company published 3 "Year Books" for the years 1951-52, 1952-53, and 1954. We are pleased to share with you copies of the first two year books*. Original copies of these year books are extremely rare and we'd like to thank Dean Butler for sharing these with us. Click the photos below to view the pdf's. *Note: The 1954 book is essentially a duplicate of the 1952-53 Year Book, which is why it wasn't copied.